Actor George Clooney, best known for his performances in movies like O Brother, Where Art Thou?, Ocean's Eleven, and Up In The Air, was taken to a hospital in Sardinia, Italy this morning (Tuesday) following a scooter accident. Fortunately, the legendary actor has been released from the hospital and is now recovering, and may even be returning to work within the week. Clooney was riding his motorized scooter to set Tuesday morning when he was struck by a car. According to TMZ, the 57 year old actor was driving about 60 miles per hour before the collision occurred. Clooney was then flung off of his scoot 20 feet into the air, reported TMZ, before he flew into a car's windshield that shattered his helmet. While it's possible that these details are rather exaggerated, considering TMZ's history of treating rumors as facts, there have been enough reports to verify that Clooney's accident was quite serious. According to The Hollywood Reporter, Clooney is now recovering at his home following the accident. It's rather fortunate that George Clooney has a home in Lake Como, as he now should be able to recover peacefully in his own house rather than having to stay in a hotel in a country he isn't used to. Here is what Clooney's representative had to say on the matter. "George was treated and released from an Olbia hospital. He is recovering at home and will be fine." All things considered, it's rather fortunate that George Clooney is recovering well. According to the details about the incident, the accident sounded rather serious. A number of people have lost their lives in scooter or motorcycle accidents that were significantly less serious. If George Clooney truly did fly 20 feet into the air into a glass windshield that shattered his helmet, then the fact that he is able to be released from the hospital so quickly is truly great fortune. According to some sources, Clooney was on his way to the set of Catch-22 at the time of the accident. Catch-22 is a six episode mini-series starring Friday Night Light's star Kyle Chandler. Hopefully George Clooney's absence from the show won't deter from the production too much, but more importantly, hopefully the production of Catch-22 won't deter too much from Clooney's recovery. Fortunately, back in April, George Clooney stepped down from the lead role in the series, which Kyle Chandler took over. Instead, Clooney took a smaller role in the show in order to make it a smaller commitment. 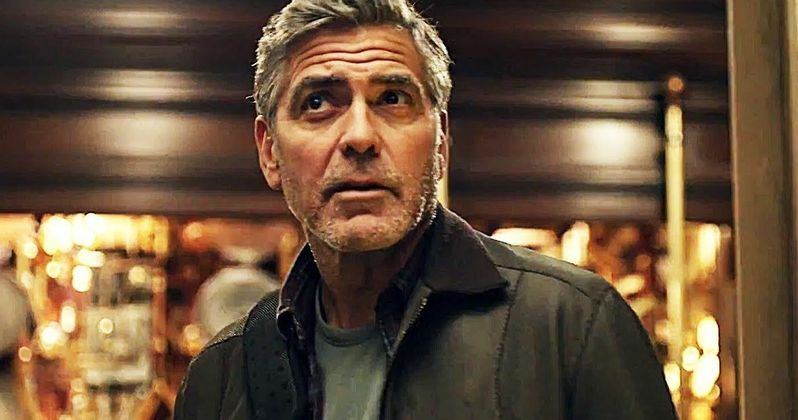 According to Page Six, Clooney will be returning to the production of Catch-22 this week, with the production still planning on moving to Rome by the end of the week. While this may be concerning as Clooney's recovery shouldn't be interrupted, it does show that Clooney is in good enough of a condition to return to work. All in all, it's great to see that the actor is recovering well from the serious accident. Hopefully it won't have any permanent damage on George Clooney and that he will continue to act for years to come.